Only in 1974, when Gatwick Airport was transferred to West Sussex from Surrey, did the parish formally become part of Crawley and hence of the Diocese of Chichester. It is outside the area of the new town and as it is close to the main runway, everything except the church had gone by the early 1970s, to be replaced by factories and warehouses. As a result, worship ceased in 2004, though not declared redundant, and since 2008 it has been used by a Seventh Day Adventist congregation. 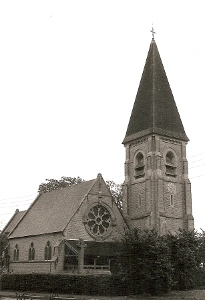 The church at Lowfield Heath was built as a chapelry of Charlwood, Surrey (VCH (Surrey) 3 p183) in 1867-68, as the church was two miles away, a distance considered unacceptably far. It is probably the finest Victorian small church in Sussex, for the architect was W Burges (Crook p215). In his pioneering article on Burges (in Feriday (ed) p198), Charles Handley-Read calls it ‘perhaps the best of Burges’s small churches’. Although Crook stresses Burges’s ability to design economically, as here, there is no doubt that at £3300 (PP125), well above the price of similar sized churches by other architects, simplicity was not cheap. Burges supervised his buildings with care, which shows in the detailing and the quality of finish. Lowfield Heath is a plain aisleless church of rough finished stone, with an almost free-standing south west tower with a big pyramid spire and single bell-openings with oversized slate-clad louvres. As described it is simple enough, but it is very different when seen. 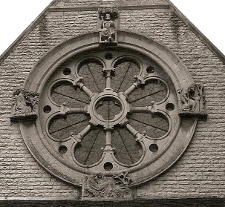 The tall nave west gable contains a large rose-window with carved figures at each cardinal point. 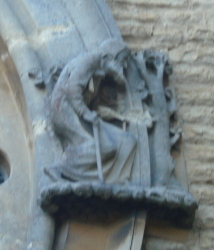 The fine carving is probably by T Nicholls, a close collaborator of Burges. Under this, a wooden lean-to porch spans the west end. 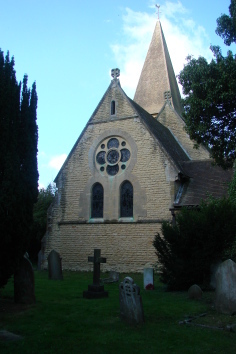 The side windows are more conventionally proportioned than many by Burges and at the east end is a smaller rose-window above two stumpy lancets. In the angle between nave and tower is a carving of a dog playing with a ball, said to be Burges’s own and to have been run over here during a visit. The ironwork of the west door displays the kind of detail that Burges loved. Inside, Burges produces a powerful yet economical progression towards the east end. This echoes the stumpy shafts and heavy mouldings of the chancel arch and the lack of decoration is barely noticed. Unusual for the period is the west gallery, beneath which is almost the only decoration inside, stone corbels carved with angels. Font: Contemporary and designed by Burges. 1. (East window) J Hardman and Co, 1875 (Index); it provides the right amount of colour at the east end and was clearly carefully designed for its position. 2. (South chancel, first window) A O Hemming (signed). 3. (North nave, first window) Heaton, Butler and Bayne (signed).